I think I’ve finally figured our how I want to use Instagram. 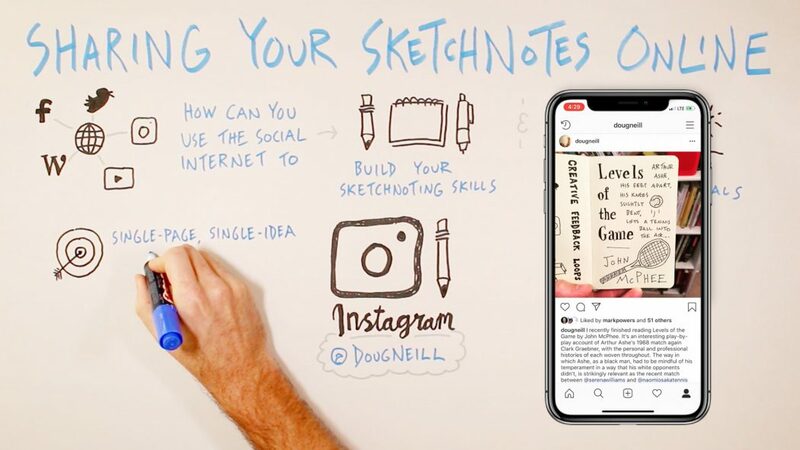 And while that might seem trivial, I think that in sharing my experience at the intersection of sketchnoting and Instagram, you’ll be able to pull out lessons for how you can continue developing and using (and maybe even sharing online) your own sketchnoting skills. help you employ those skills to move you in the direction of your personal and professional goals. When talking about the social internet, I’m referring to things like Facebook, Twitter, Instagram, YouTube, and even blogging on your own website using a tool like WordPress or Squarespace. 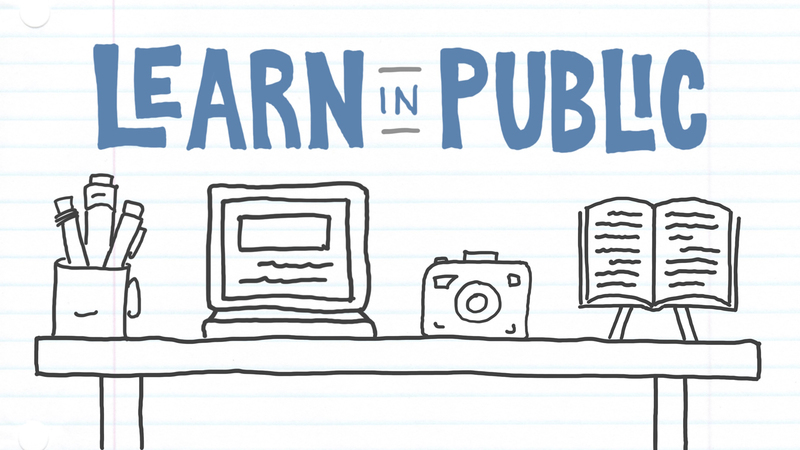 Each of those platforms provides a unique opportunity to share your work and have conversations with others about it. And I think it’s worth giving each of the platforms that you choose to spend time on a specific role, a specific purpose, that’s aligned with the strengths of that platform. So as a small little case study, let me share with you how I’ve been Instagram lately. 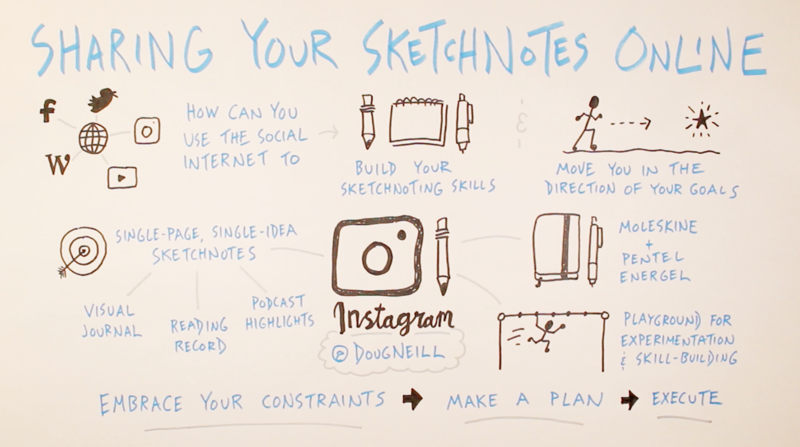 My general approach on Instagram has been to keep it simple: sharing single-page, single-idea sketchnotes; using a small moleskine journal and single black pen; and treating those sketchnotes as a playground for low-pressure experimentation and skill-building. 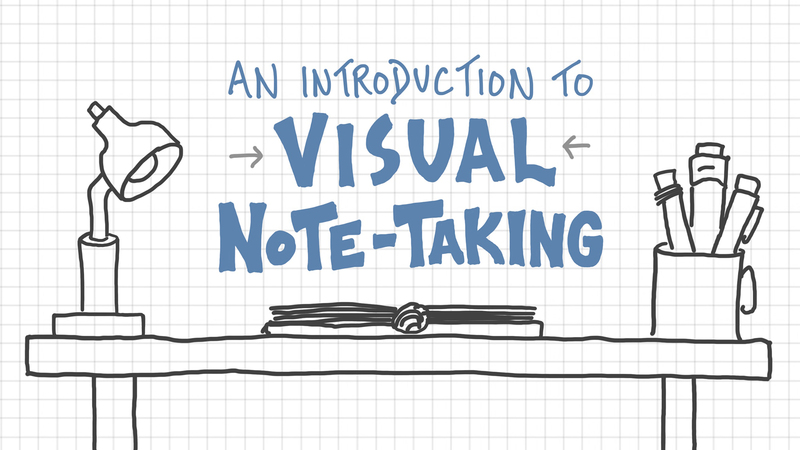 When it comes to the ideas that I’m sketchnoting, they fall into a few different categories. Sometimes I treat it like a visual journal – sketching out an object or a scene in front of me that I find to be interesting or important for one reason or another. I also like to add a new sketchnote every time I finish reading a book – capturing the title, a single quote, and a relevant image not as a way to summarize the book but just to mark the time at which I finished it and, within the caption, my initial thoughts about it. Those aren’t meant to replace a fuller processing and sketchnoting of the books that I read, it’s more of a reminder to myself – this is when you finished the book and these were your impressions right after reading it. Instagram is also a place for me to capture those important ideas that I might hear in a podcast that I’m listening to while out on a walk or a video that I watch during a break in my work day. Again, that isn’t a place to create a single-page summary of an entire podcast conversation, it’s simply an opportunity to pull out one idea that resonated with me and do my best to capture and share that idea visually. What I like about capturing and sharing single-page sketchnotes in this way is that the benefit is cumulative – I can use those sketchnotes and those photos in my future work – future blog posts, future videos, future courses or future books when I want to reference or revisit one of the ideas that I decided to sketch out. Even the decision to hold the notebook in one hand and snap the photo with the other is intentional. I don’t want to have to pull out a scanner and isolate just the sketchnote itself every time an interesting idea comes my way. My way is quicker and simpler, and I kind of enjoy being able to show just a little bit of the background behind each sketchnote – it gives me a clue to where I was when I sketched out that idea, and that adds a depth to the photo that it wouldn’t have if all you saw was the sketchbook page. At most I’ll post once a day to Instagram. In an ideal world it would be every day, but sometimes other tasks, other projects, other sketchnoting work takes precedence. But I like that I know that I have this place to share those singular ideas that don’t necessarily fit anywhere else, not yet at least. So as you think about how you might use the tools of the social internet to build your skills and work toward your goals, I encourage you to first embrace your constraints. Take into account both the constraints on your days and the constraints of each of the platforms that you’re choosing to spend time on. Then, make a plan so that you can be intentional about how you’re spending time on that platform. And finally, execute on that plan and see how it goes, making adjustments as needed. 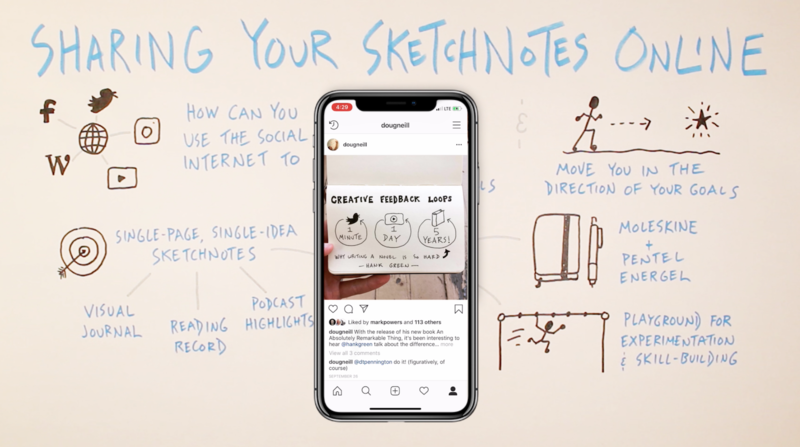 I hope that this one example of how I’m using Instagram helps you to think about how you might share your sketchnotes online in a way that both supports your skill development and helps you take those steps toward your personal or professional goals. That course will help you develop your own strategy for sharing your work in alignment with your long-term goals. 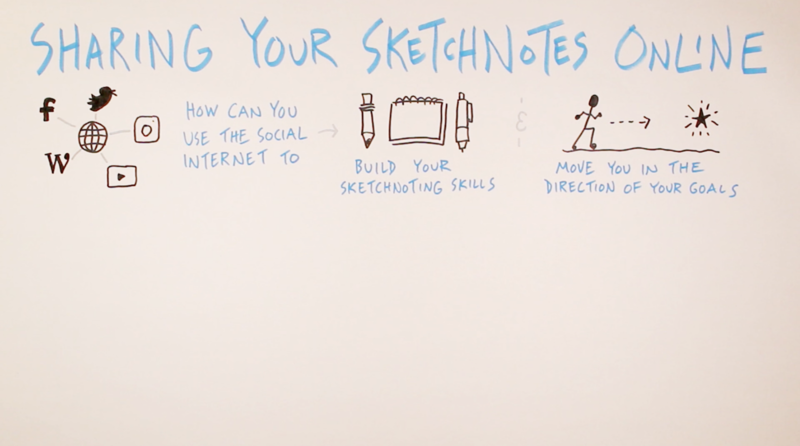 I hope you found these ideas about sharing your sketchnotes online useful. I’ll see you next time.